We hope you can join us for the service and also for an informal dinner that evening. To help with planning, could you please respond as soon as you can using the following link to let us know whether you will be coming. Irwin was born in Swan River, Manitoba and moved as a teenager to B.C. where he attended the University of British Columbia. Graduating in Medicine, he married Lois, a nurse, and did postgraduate studies in Ear, Nose and Throat in London and New York. They have a son and a daughter. Irwin had a Consultant practice in New Westminster for the past 28 years and served on the Executive of both Provincial and National Societies of Otolaryngology/Head and Neck Surgery. He also served on the Executive Committee of the B. C. College of Physicians and Surgeons. At the University of British Columbia, he taught for many years in the Department of Surgery where he served as Clinical Professor. 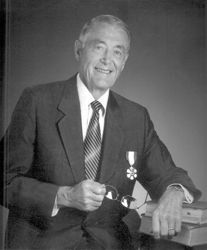 In 1984, he was the recipient of the Mosher Award for outstanding clinical research in the field of Hearing Loss in Children and their Education. Irwin joined the New Westminster Rotary Club in 1977 and became active in Youth Exchange both at the Club and District levels, serving as Chairman of the Youth Exchange Committee for Multi-District 5040/5050 from 1986-89. In 1990, he was elected Canadian representative to the World Council of Regional Advisors of Rotary Youth Exchange. Irwin taught surgical skills for one year to a Fijian surgeon brought to B.C. through a Rotary Foundation Grant Project. Irwin and Lois travelled to Kenya twice as Rotary Volunteers to participate in "Operation Hearing", sponsored by Rotary's 3-H Program. As well, they carried out extensive volunteer medical work in the Canadian North, in Thailand, and in the South Pacific. He served as District 5040 Governor in 1993/94. The district conference was a combined conference with District 5050 held in Victoria, British Columbia, and was a major success, attracting over 600 Rotarians. Irwin was a volunteer leader many times on hearing projects in Zimbabwe and Uganda. He introduced many Rotarians to international service when they accompanied him on these projects. He promoted the development of solar charging for hearing aides for developing countries where the cost of hearing aid batteries is prohibitive. He assisted in shipping and setting up specialized surgical equipment in several clinics in Africa. He was a long-time volunteer with the Rotary Help Exchange. In 2000, he led an all medical GSE (Rotary Group Study Exchange) Team to China focused on alternative medicine practices.